Another Conservation Success Story Hijacked by Climate Alarmists | Watts Up With That? The authors, from the Smithsonian Environmental Research Center, use a bewildering array of statistics to suggest mangroves are marching march northward along the coast of Florida only because climate change has resulted in just 1.4 fewer days with temperatures falling below -4C between 1984 and 2006. However the authors admitted “decreases in the frequency of extreme cold events was only significant if an extreme cold event was defined as colder than −4 °C; the relationship disappeared when the temperature threshold was raised a small amount” but they later imply this suggests just how sensitive the mangroves are too what most of us would see as an insignificant change. However I knew people who participated in Indian River Lagoon Shoreline Restoration Projects – Volunteer Events a few years back. That’s the very area that the authors claimed the expansion of mangroves could only be explained by climate change. 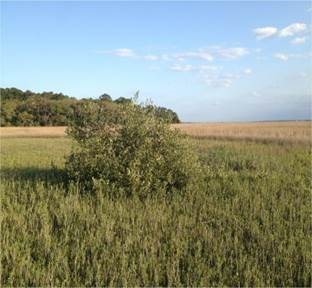 Yet these CO2 advocates ignored well-advertised activities such as the “Florida Department of Environmental Protection’s Shoreline Restoration Project” which is working to identify suitable un-vegetated and disturbed shoreline areas to restore fringing mangrove habitats along the Indian River Lagoon. This is accomplished through planting red mangroves (Rhizophora mangle) and associated species, such as marsh grass (Spartina alterniflora). So I sadly present the authors with my “Cheesy Climate Science Award” created in honor of past researchers who lead the way by hijacking conservation success stories and metamorphosing them into a climate catastrophe campaign as done in the IPCC paper here. Whether climate change is natural or manmade, we can make a more resilient environment by restoring habitat and watersheds. We must demand more critical thinking, so that such frivolous publications stop misrepresenting honest conservation efforts in order to create a picture of climate doom. Trustworthy environmental stewardship must be guided by better science. Thanks, Jim, for another enlightening article. Seems that not too long ago there were quite a few reports of large numbers of invasive species literally falling down dead from trees due to cold snaps in Florida. National Public Radio carried an extensive story on this paper yesterday morning, including an interview with the lead author. He expressed no doubt at all about the validity of the paper’s conclusion that climate change is responsible. The state plants a whole bunch of man groves and along comes a scientist, who ignores mans influence and then touts the increase as evidence of CAGW…. ?? And those doing the study couldn’t figure this one out? This is another example of what happens when we use satellites to measure things that could not be measured in the past. It is amazing that this study is getting so much publicity as it is based on a range of 1984 onwards after a historical era of freezes in Florida in the 1980’s a roughly 100 year event (at least on the several hundred years of data that we have as the previous big freeze as 1894-95). This new paper has no data before 1984 which is when Landsat data became available and makes no attempt to find pre-1980’s sources. ‘Dr. Gruner said that scientists needed to start considering changes beyond just average temperatures as they analyzed the environmental consequences of climate change. More surprises are likely in store, he said. Forget the tiny potential contribution from temperature change and very short time frame. While the focus is on this, the empirical data shows that the irrefutable law of photosynthesis is having a positive effect several orders of magnitude greater. As a result, earth’s biosphere and vegetative health is booming. Plant growth(especially woody stemmed) is benefitting greatly. I am not a geologist but fancy this sort of stuff… The geologic record proves this planet warms and cools in natural cycles – something these climate change nuts ignore. So ridiculous. Well, if it were actually warming, which it doesn’t for 17 years now, that would also benefit the biosphere; as biodiversity tends to be higher the higher the average temperature is. If UNEP finally drops the CO2AGW scare and switches to the biodiversity scare we can demand more Global Warming because that helps biodiversity. Maybe they already recognized that and therefore don’t start their biodiversity campaign on a grand scale. One warmist crap strory after another. I’m really getting boared. This is kind of funny–I lived in the Daytona Beach/New Smyrna area from 1984 to 2000 and after a big freeze in the 80’s I helped some conservation groups replant mangroves along the Halifax River to restore habitat. I thought we were doing a good thing but there you go!! Not as scary as Dr Gruner! A fraud. A fraud by the Smithsonian. I feel a need for a special stupidity descriptor for this type of non-sense. Perhaps ‘G-WS’ for ‘Grant-Whore Stupid’. This is really getting to be too much. Thank you, Mr Steele, for the article, and Mr Auton for the comment. I read this article and the first thing that came to mind is “so what else is new?”. It seems that people with an axe to grind always carefully edit out anything that doesn’t fit into their storyline. The example that came to mind as I read this piece concerned a book that came out several years back, “The Great Lakes Triangle” in which the authors tried to tell you that the ships that disappeared on the lakes did so for mysterious reasons. They even edited out the storm which caused the loss of the “Edmund Fitzgerald” because the storm wouldn’t explain the loss of a giant ore carrier, now would it?? It comes as no surprise, therefore, the AGW alarmists will edit out any explanation which doesn’t fit their theory or would allow for alternative explanations to an event other than their theory. so lets look at the details, when and where do they start monitoring the mangroves, are the mangroves just recovering from past loss. Hurricane Donna, in 1960, damaged an area of 100,000 acres of the Mangrove zone of South Florida. Loss of trees ranged from 25% to 100% from shearing the trunks above ground, complete overwash of islands and prop root damage from marl and fine organic matter coating the roots. SHORELINE DEVELOPMENT has replaced Mangroves with marinas, dredged channels, airports, filled lots, seawalls and other commercial and residential construction. 60 percent of shallow water open Mangroves in the Upper Keys were lost between 1965 and 1985. 40 percent of that was due to dredging and filling of Mangroves. This loss is not restricted to the Florida Keys — other areas, such as Tampa Bay, Marco Island and the lower coast of Florida, have lost mangroves. Approximately 11,000 acres were lost between 1943 and 1970 in Collier, Monroe and Dade counties alone, of a total of 430,000-500,000 acres in all of Florida. While not overwhelming, losses at specific locations have been substantial. Mangroves have been lost due to shrimp farming throughout the Phillippines and other parts of Asia. OTHER THREATS are illegal dumping, beach renourishment, oil spill, agricultural run-off that contains herbicides, pesticides, and sugar cane wastes. Man-made canal systems have altered fresh water run-off in the Florida Everglades, dramatically changing salinity levels and lowering the water table. Thanks for the chuckle. I highly recommend that you submit this case for an Ignoble Prize in Climate Science of anthropogenic warming or ecology etc. Every Ig Nobel Prize winner has done something that first makes people LAUGH, then makes them THINK. . . .
there was a massive die back of mangroves in the northern region Florida in the 1980’s, they are just recovering so you will see areas that were once devoid of mangroves growing back. They seem to think we have no memory beyond a week ago. Then, in winter 2010, a cold snap settled in. Freezing temperatures killed the macroalgae that normally live near the lagoon’s surface. As these seaweeds withered and died, their sequestered nutrients flooded the already nutrient-saturated, saline water, creating a potent soup that would fuel the lagoon’s collapse: A blue-green algae superbloom. In the summer of 2012, the lagoon turned the color of paper bags as a brown algal bloom took hold, further shading and choking off any recovering seagrasses. 2010 wasn’t that long ago! Why it was just yesterday wasn’t it…. I wonder if they are going to claim ” the conservation success” of entire forests to be cut down, turned into bio mass, transported to Europe and to be burned up in coal plants to fight AGW? The warmists and their policies have become a menace for the entire world, man and nature. I read of this article in the NYTimes, and was immediately skeptical. “Scary” that mangroves are recovering? I did some research too: thanks for the additional pointers. The longer the CACA Cult keeps spinning out its Message, the worse its going to be in the aftermath. Its doubling down will be proof of its basic bad (to-the-bone) faith–and a good reason to ignore it in the future. I think all global warming conferences need to be held in Winnipeg in the dead of winter. They wouldn’t have got funding without the magic words in the grant submission, would they? Even climate McScientists have to eat! I thought climate change meant an increase in extreme weather events, both hot and cold. Isn’t that what they claim whenever an unusual cold spell occurs anywhere on the planet? I just checked the “climate change” page on Wiki, and it says climate change can cause “more or fewer extreme weather events.” Talk about a non-falsifiable prediction! But even so, how do the authors of this paper know that climate change will only cause a “decreased frequency” of extreme cold events in Florida? I can guarantee that if a record cold event occurred tomorrow within the same area as this study’s location, they would immediately claim that man-caused climate change was the cause. These authors would be among them. Is there any doubt of that? Bill H says: January 1, 2014 at 8:28 am … The state plants a whole bunch of man groves and along comes a scientist, who ignores mans influence and then touts the increase as evidence of CAGW…. ?? And those doing the study couldn’t figure this one out? NPR has a well-defined customer base in the environmental socio-political movement, and they serve that customer base in those ways that keep the money flowing in. NPR’s credibility with its own customer base will not suffer in the slightest from carrying a story on a pseudo-scientific paper that has been demonstrated to be transparently fraudulent in its data, in its methods, and in its ultimate conclusions. NPR is one with its user community, and so there will be no post-discovery updates concerning the NPR story, no clarifications will be made, and certainly no acknowledgement of the blatantly fraudulent science inside of the paper will be offered. Then there were the green Iguanas, numb with cold, falling out of trees in Miami in 2010. Then there was the 2013 article on an old oil/gas power plant near Kennedy Space Center being upgraded to natural gas combined cycle, and the requirement that the old plant’s thermal plume into a local river be maintained to protect the hundred’s of wintering Manatee from freezing to death in future years of global thermageddon. Or something. I did some checking based on the PNAS paper and SI. It says virtuall the entire paper study area is the Indian River Lagoon (in fact a nearly 150 mile long estuary spanning 4 coastal counties. Mangrove restoration started in 1996. By the time of a special restoration report on best practices, there had been 57 separate restoration sites planted. Proportionately, seedling survival was most successful in the northern half of IRL because of less runoff pollution ( from 1989 to the present, the proximate population has increased 50% to 1.6m). Freezes are a big deal in Florida because of the citrus industry. $2 billion of citrus is produced in the 5 counties containing the IRL. The industry maintains a ‘freeze’ website. ” major freezes” damage that years fruit, not the trees. “impact freezes” damage or kill the trees. There was a major freeze in 1981. There were impact freezes in 1983, 85, and 89. There have been none since. So this paper is not charting AGW ecotome tipping points and mangrove [invasion into salt] marshes. The satellite images document natural recovery progression ( mangroves need ‘nurse’ salt marsh grass species like S. portulacastrum or S. alterniflora [smooth cordgrass]) from the killing 1980 freezes. Plus a lot of hard volunteer work to repair man made IRL damage. 40000 acres of IRL wetlands were lost to [misguided] mosquito control alone before the nonsense was stopped and the restoration projects begun in the 1990s. 16000 of the 40000 acres lost was mangrove ‘forest’. Most of that was in the northern half of IRL, from Melbourne to Cocoa Beach to Cape Canaveral to Titusville. I quickly wrote this post after I was involved in a discussion with members of the Environmental Consulting Professionals group on Linkedin . They were debating a post by a overzealous CO2 alarmist “Should this and other Linked-in forums ban inputs from climate deniers following the lead of Reddit’s science forum.” Some wanted to ban all us “deniers”, while most did not. Although many acquiesced to allowing us “deniers” to speak, a few offered a final dig saying we must allow deniers to speak no matter how ignorant, etc. etc. In that vein one poster suggested climate change catastrophe is happening now and for proof mentioned the “northward march of tropical mangroves”. But knowing that mangroves are being replanted in that area, I knew once again that honest conservation efforts to restore destroyed mangrove habitat was being misinterpreted as the result of climate change disruption. It is an ironic example that is the skeptics in blogosphere that will science honest, much like they exposed Gore’s myth of Kilimanjaro, because climate science’s “pal review” too often ignores blatant contradictions. I can’t find a free digital copy of an insightful 1997 paper on this issue, “Rehabilitation of impounded estuarine wetlands by hydrologic reconnection to the Indian River Lagoon, Florida” Special Issue: Hydrologic Restoration of Coastal Wetlands Wetlands and Management, vol. 4, no. 2, but in that paper there is a picture taken in 1980 of how impoundments had killed mangrove forests and a follow up picture of restoration’s positive effects. However unless they get the hydrology right mangroves are slow to respond. But over recent decades, researchers have been experimenting with better hydrologic restoration and re-plantings. Where ever they correctly restored the hydrology there is rapid increase in mangroves. I have decided as part of a ‘New Year’s Resolution’, to voice my displeasure to the organizations/authors when I read about papers such as this PNAS one. Sure would love to see the ‘general public’ get more invovled. Sure, maybe one comment won’t have a great effect, but a large number might. I am writing to voice my displeasure with noted paper and trying to tie the expansion of mangrove forests to ‘global warming’. It seems that nearly EVERYTHING seen in nature today is a sign of ‘global warming’, or ‘climate change’, with CO2 being cited as the the cause for the change/warming. That clearly is not the case, and seems very apparent with this paper. I hope Jim has also contacted you and the authors also. Better yet, perhaps you could have the authors contact Jim or Anthony Watts, in order to post a ‘rebuttle’ to Jim’s article – IF you have one. So, are any of the researchers here going to write up a corrective note for PNAS? Or a collaborative group of researchers? That would seem to be the next step, if one actually wants to have an impact. If the analyses here are correct, the corrective study should be straight-forward. Document the recovery after freezing, and the areas of conservation-restoration. Show they correspond with the claimed areas of AGW-induced northward migration. Submission within a month or two should be possible. I would like to see the scientists who peer-reviewed this paper defend their reasons and explain why they ignored such blatant confounding factors so easily uncovered in less than an hour of searching. Thats why some call it “pal review”. The biggest defect in peer review is not the gate keeping that prevents skeptical arguments hidden, but the utter spamming of articles that lack scientific rigor simply because it fits the prevailing bias. Jim, I have a pdf copy of “Rehabilitation of impounded estuarine wetlands by hydrologic reconnection to the Indian River Lagoon, Florida.” If you email me at pfrank_eight_three_zero_AT_earth_link_dot_net, I’ll send it to you (2.1 MB). The comparison you mentioned is Figure 3. By the way, the paper itself is here, if you can download it directly. I read this and thought “You’re Kidding!”. After graduating Uni in 1985, I moved to the Orlando area and was struck by all the dead orange groves due to the earlier frost events. There is a popular strip there called Orange Blossom Trail. Locals told me before the die off, the air was so sweet with the smell of orange blossoms, it would almost make you sick. Let me know when the oranges groves come back. Sadly, most turned into strip malls… Its called recovery. Look it up. The upgraded Florida Power and Light combined cycle natural gas power plant is in the same Indian River Lagoon area. Martin C, two years ago I posted here a critique of another PNAS thresholds paper, on corn yield and high summer temps. That paper was so flawed it should have been withdrawn. I wrote PNAS, provided the scientific and statistical evidence, and never got a reply. Last year I posted two critiques of Marcott over at Climate Etc, where I am an infrequent contributor. The second proved scientific misconduct in redated core tops. Steve McIntyre provided additional proofs. Again wrote (Science) requesting correction or withdrawal. The letter’s receipt was acknowledged, but nothing was done. Last year I posted on clearly misleading and misrepresented science on Eemian sea level rise in WA published in Nature Geoscience (again at CE, title By land or by Ses? ). Wrote the lead author and the journal, presented the evidence, and requested correction or retraction. No response from either. Last year I posted on a clearly misleading Seattle Times piece based on a really bad PMELmpaper concerning Pacific oysters. (Again at CE, titled The Shell Game). Wrote the Seattle Times reporter requesting at least a newspaper errata. Never heard back. Just like the erasure of critical remarks at RealClimate or SKS, the journals ignore legitimate critique that exposes their shoddy review practices and bad published science. The Climate gate ‘control journals and pal review’ is very much still in evidence. This would be a red flag to any person of normal general knowledge. Just down the road from me are mangroves at 38 degrees south. The, admittedly very stunted, trees have been there longer than I have existed, and in my 60+ years have not changed in either size or location. Mangroves at 37 41′ S are considerably larger and in my memory always have been. Those at 36 50′ S are full sized. Perhaps our southern mangroves in a fully maritime climate are tougher than the Florida versions? Thanks, Rud, for the info. It shouldn’t surprise me one bit that no replies ever come. Maybe it’s my ’tilting at windmills’ – but I still am going to make the effort. They probably wouldn’t care if Dr. Pielke, Dr. Curry, Dr. Spencer, and dozens of others in the field all contacted them at the same time, to let them know how bad the papers are (. . . which from Dr. Pielke’s post above, it appears some are . . . ). It is impossible to overstate the extent to which NPR swallows the entire line on AGW. It simply never occurs to them that it isn’t a fact. There were different effects from the 1989 freeze vs. the 2010 freeze. The 1989 freeze was cold enough to kill 50-year old Australian Pines in Brevard county (and a key lime tree in my back yard), but it was a short freeze. The 2010 cold spell was long term, but never got cold enough to kill citrus, at least not in the areas where citrus was still grown. It did, however, affect the water temperatures more so than 1989, causing much damage to aquatic grasses in the Indian River lagoon, and to corals in South Florida and the Keys. Just another scientific twerking performance by some smiling virus’s with letters after their names. More made for media, GIGO statistical manipulation. Yawn. The platonic concept of doing science was closing your eyes and ears so that the noise of the real world could not disturb your thinking and ideas. It seems that the modern version is to sit ensconced in a computer room and and fiddle with models and limited data sets from satellite imagery. Get muddy in the Mangroves? No way! Is there any evidence at all that conservation efforts can explain the northward expansion of mangrove populations besides you anecdote from 2O10. The period study ended in 2011. So unless the increase was due to the one year you mentioned, I would seriously doubt it. The highest-latitude mangroves I have ever seen are in Corner Inlet in Wilsons Promontory National Park in Victoria, Australia, that’s about 38.8 degrees south. These are also very stunted. The highest latitude mangroves I’ve seen in Eurasia are north of Nabq in Sinai, about 28.2 degrees north. These are fairly substantial and there may well be more northerly stands I don’t know about..
Joe, Of course I would be suspicious if it was just one year. The point is that any conservationist concerned about mangroves is aware of these restoration efforts. Don Auton provided a link to a paper I commented on describing how the impoundments of salt marshes to control mosquitos had killed most mangroves and that since the 1980s people have been working hard to restore the mangroves. Talk to conservationists. Plantings have been part of several decades worth of restoration efforts. Joe anecdotes are not very scientific. Joe It is not very scientific to ignore confounding variables that could explain a phenomenon. If the authors were good scientists at the very least they should have addressed the well known issue of restoration.At the very least a knowledgeable peer reviewer should have demanded they addressed the issue of restoration. But instead they pushed global warming. The improved growth of mangroves around the Indian River Lagoon is a testimony to how people can learn from past mistakes and improved the environment. I don’t why you or the authors insist on turning a conservation success story into a tragic tale of climate doom. Joe is known for drive-by FUD. It’s his only competence. Advancing and restoring mangroves is a crucial coastal and wetland initiative. Whether it will fare well in the coming cooling is the real issue and problem. A_thony refers to “highjacking”. That’s only half of it. Distortion and black=white logic shamelessly presented and publicized is the rest. scarletmacaw – I was there for the 2010 freeze. It killed manatees. It certainly was cold enough, by the criteria in their paper, to kill mangroves. “The January 2010 cold snap was the coldest 12-day stretch since the 1940s, according to the National Weather Service. Temperatures in the Everglades never rose above 50 degrees during that time. At least 244 manatees were killed by cold, leading to a one-year record for total deaths, according to the Florida Fish and Wildlife Service. A plunge in ocean temperatures killed off corals in shallow waters from Biscayne Bay through much of the Florida Keys and left hundreds of sea turtles dead or stunned and sick. The 100-plus carcasses of rare North American crocodiles represented about 10 percent of the coastal population. I wasn’t disagreeing, merely pointing out that the two cold events had two different effects. Everything you listed as being harmed in 2010 was aquatic, which agrees with my point. In both cases, these were record cold events, which are NOT consistent with CAGW in spite of the warmist claim that anything and everything is consistent with CAGW. In 2010 the cold caused the death of corals 100’s of years old. Was your point that the mangroves that were referred to in the paper ended up being killed by the cold in 2010, and the authors ignored that and chose to only include mangrove data up to 2006? No surprise here that CAGW advocates would spin the data to support their religion. I am sure that information is going over real well with the Aussies and those in the USA who are not allowed to clear brush or make fire breaks and are in danger of losing their home or already HAVE lost their homes. …. Just like the erasure of critical remarks at RealClimate or SKS, the journals ignore legitimate critique that exposes their shoddy review practices and bad published science. The Climate gate ‘control journals and pal review’ is very much still in evidence. And it is going to come back and bite them. Actually it already is beginning. As another Commenter just pointed out on the ‘Climate adaptation, a wicked problem, requires navigating a landscape that is only partly known’ thread, you are now seeing Abstracts that have nothing to do with the paper. Younger scientists are learning to write politically correct Abstracts to get grants and to get through Pal-review and then publish the actual paper with real data that contradicts everything said in the Abstract. You are also getting blogs like this and Retraction Watch and others. Sooner or later the shoddy work will catch up with the old reputation and the journals and professional societies will find themselves faced with young fresh competition. Think of how many scientists here on WUWT who have already voted with their feet and dropped journals and professional societies out of disgust. is clearly wrong. I do not know how the mangroves dealt with the more recent cold, but they clearly must have been impacted to some extent if the other parts of the environment were. I agree with you that this paper and the news articles on it are spun. In the spring of 2010 or 2011 I was shown a report of birdologists at Colony Farm, Coquitlam about missing Barn Swallows. We were having a cool, wet spring and bizarrely was linked to global warming / climate change. This new weather was going to ruin the tourism business of Vancouver, apparently, so windmills should be erected all over the place, also apparently. This distressing news was followed by one of the longest stretches of good tourist weather, with the driest September on record, for Vancouver, though there had been longer stretches of dry weather in the past, just not falling to the end of September. Anyways, back to the birds. After the bird report, I was in the mindset of these missing birds and I started noticing Swallows while on my regular evening bike ride. I live only a few miles away from Colony farm, and while riding on the Pitt Meadows portion of the dike, an extensive infrastructure throughout the Surrey Metro area, which contains the bedroom community of Vancouver, I saw these missing swallows flying about, I counted a dozen or so just on this one outing. The next night, while riding along the De Boville Slough, I looked up into the darkening evening sky and started counting the silhouettes of swallows, first by twos, then by tens. There were over a hundred swallows. So much for missing swallows. Back to the Farm: Colony farm is so named as you might guess because it used to be farmland, complete with farm infrastructure like barns. While riding through the park this past summer, I sometimes stop and watch the Barn Swallows flying around and around along the river that runs through it. Wildlife habitat. Keep Out. No Dogs or People. Metro Vancouver. Sheep Paddock Estates Expansion, Phase 2 Completed 2008. Raptors now have outstanding convenient perching posts from which to enjoy the view and search for snacks. 200 species of birds (199 competing species to the Barn Swallow). I have pictures but I don’t seem to be able to get the links working while at the coffee shop. You can find them later @protonice if you like. Going o/t here, but am curious if any FL based commenters know what temps will provide a barrier (if possible) to the spread of invasive reptiles, like the Burmese python. I know the winter of 2010 caused some die off, but then we continue to see the stories of very large pythons that must have survived that weather. I find myself wondering why Warmists are so insistent that all present ecosystems remain exactly as they are in the places they now exist. Whatever the reason the mangroves are moving, aren’t they a valid ecosystem? When I went to Disney World in 2007, there were a lot of producing orange groves around Kissimee that were not being worked. Obviously many trees have recovered that were abandoned after the freezes. Pardon my stating the obvious. Conservation is NOT the same thing as Environmentalism. Example: A few years ago, Environmentalists in Denmark wanted to put bird choppers — I mean wind turbines — in Thy National Park. At times, Environmentalism is the exact opposite of conservation. I consider myself to be a Conservationist. I believe in things like National Parks, National Forests, and clean water. However I’m definitely not a 21st Century Environmentalist. One of the things that I like about Jim’s excellent essay is that it highlights the important distinction between Environmentalism and Conservationism. By producing I meant that they were covered in fruit. The abandoned part is because the grounds were very overgrown and the trees obviously had not been pruned in years. They were across from a condo development I rented a unit in for the trip. They will very likely fall to development if they haven’t already. Don, I am now from FLL. We know that anything below freezing stuns, but does not necessarily kill, invasive green iguanas (lots of pics from 2010). We know that lower water temps kill peacock bass, which is why they were introduced into South Florida from Brazil but cannot spread as far north as Lake Okeechobee. We do not know what it would take to kill invasive Burmese pythons. Personally, I think a Mother Nature experiment like 1989, short sharp freeze, would be instructive even though we would have to go replant the mangroves yet again. Problem is pythons are now throughout the Everglades, and Mother Nature’s experiment below Lake Okeechobee would do far more environmental damage to that unique resource than the damned pythons themselves. Come on down for the next python hunt. Every little bit helps. You versus 18 foot long snakes. Confirmation bias strikes again. Psychologists should be having a field day studying the climactivists. I, am mere amateur, was able to quickly find. in a 76 percent reduction in mangrove wetlands along the Indian River Lagoon”. 3. The Cavanaugh paper mentioned neither of these things. This is like religious fanatics claiming that a good medical outcome must be due to divine intervention, not the hard work and dedication of highly skilled professionals. The climate kooks require that all problems be attributed to climate. Human effort to manage the environment, no matter how well documented, does not register in the mind of the CO2 obsessed. It is always climate and CO2. And the CO2 obsessed are the only ones with the correct perspective on the issue. 26-27 latitude is the tipping point for mangroves? Balderdash.They absolutely thrive around Sydney, at 34 S.
It’s the old slice and dice statistics trick. Break the data down into enough sub-categories and eventually you’ll find one with a rough correlation to what you want. A category consisting of the places with the number of days with temp below -4 exceeding 1.4: how contrived, what a joke. Are the trees ok for 1.3 days but die after 1.4 days? How does a place have 1.4 days below -4 anyway? If the temp was below -4 during the day then that would be one day. Did he select the places where mangroves increased and then average the number of days below -4 over the number of places? This isn’t science.